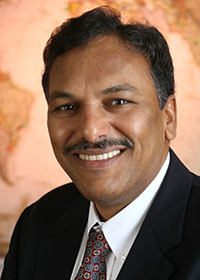 Professor Dravid's cancer-related activities revolve around basic science and applied technology for cancer diagnostics/imaging and therapeutics. His basic science contribution and accomplishments include role of electron and light scattering in understanding of nanoscale architecture of cancer cells. He has also developed innovative magnetic nanostructures (MNS) that can enhance magnetic resonance imaging (MRI) contrast for diagnostic imaging of cancer and related diseases. He and collaborators at CCNE and PSOC programs are developing novel theranostic agents that combine "diagnostics and therapy" in one single nano-construct. These are based on MNS with functionalization to enable targeting, localization and thermal therapy. Professor Dravid's research group is pioneering the MNS nano-constructs for innovative diagnostics imaging of cancer coupled with thermal therapy and thermally-induced drug and therapeutic delivery. Professor Dravid is also engaged in development of major characterization facility infrastructure and global program development. He is passionate about conveying the beauty and complexity of science and technology via local, regional and global outreach.